Go to the most recent entry on this page. 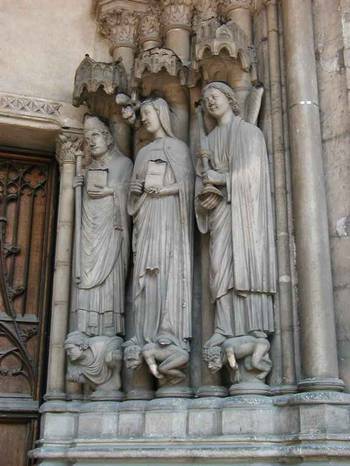 13th century figures in the central doorway of Église St.-Germain-L'Auxerrois -- the middle figure holds a candle, that the devil is trying to extinguish. But an angel nearby stands ready to re-ignite the candle. 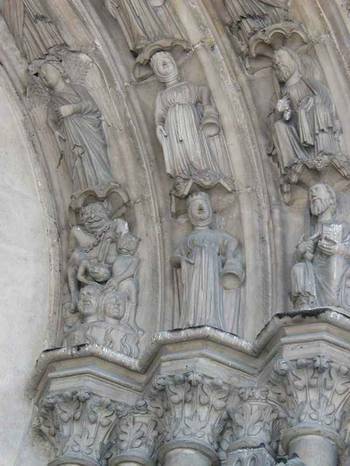 The carvings above and below are also from the 13th century doorway. Notice the birds nest on top of one of the figures, below, and the dead bird hanging by a string. Wish I knew the story here. After leaving the church, we walked on the busy shopping street, Rue Rivoli, toward the Hôtel de Ville. We stopped at the pretty park at the Tour St. Jacques. The tower was encased in scaffolding, but we still enjoyed the park. Crowded as the area is, there are plenty of birds here, and hence, there was a black cat hunting them. The cat and a rabbit live in a clump of bushes in the little park. I tried to get a pic of the cat, but it was too sneaky and evasive. Last year at the Hôtel de Ville (the city hall for all of Paris) there was an exhibit about the Seine. 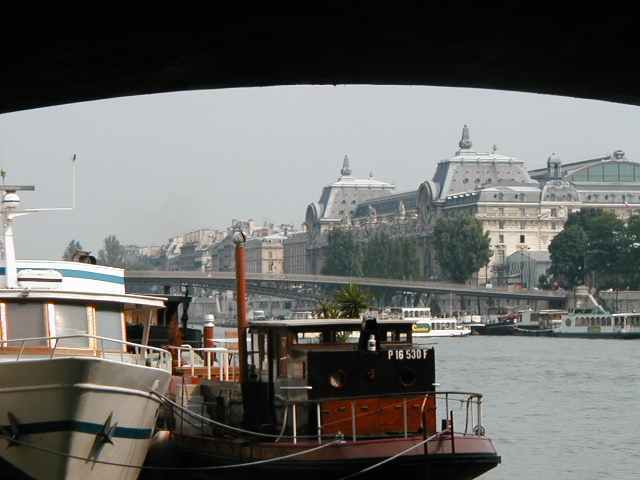 This year, there is one about the canals of Paris. I now realize the significance of these water-based exhibits at city hall. 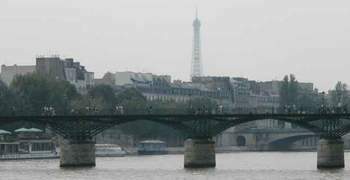 Paris was ruled by a representative of the king until the 13th century when municipal government was introduced. 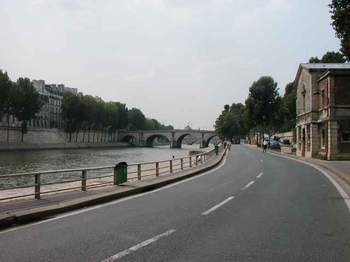 According to the Michelin guide, "The powerful watermen's guild held the monopoly over traffic on the rivers Seine, Oise, Marne, and Yonne, and regulated levies. 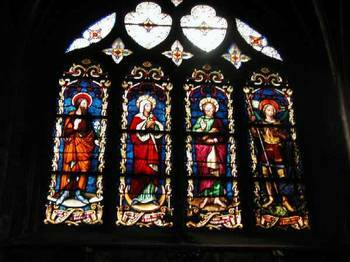 In 1260, Louis IX appointed leading men of the guild to administer the township. The municipal assembly was headed by a merchant provost and four aldermen who were elected by notables, who in turn nominated the town councillors." 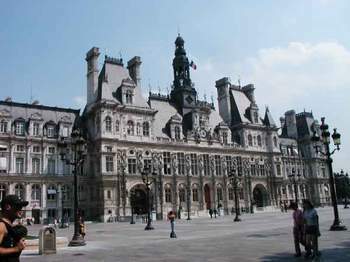 The Hôtel de Ville, completed in the early 17th century. In yesterday's International Herald Tribune, there was an article about how miserable Parisians are this summer. We had no idea! Anyway, it brought our attention to something that I think I had heard, but I had no notion of the extent of it. 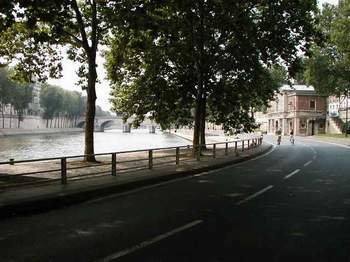 A section of what is normally very busy roadway on the right bank of the Seine has been closed to autos and is open only to cyclists, pedestrians, and roller bladers for part of this summer. So we made a point of walking it yesterday. It was about 4 miles. 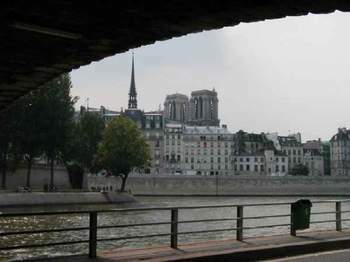 It is wonderful to be able to walk along the Seine and really enjoy it -- I hope they do this every summer (in spite of what the author of the article has to say about it). 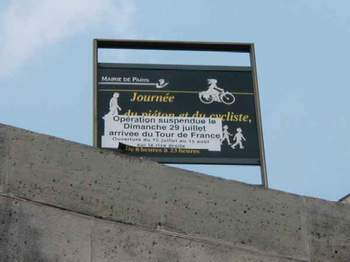 This sign announces the "day of the pedestrian and the cyclist" -- that the road on the right bank is closed to cars, open only to pedestrians and cyclists, from July 15 to August 15, except for July 29 when the Tour de France will be using the road. 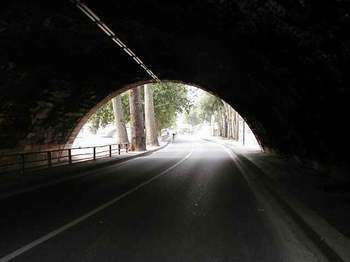 The "piéton" on the white line is Tom. As we walked along the Seine with NO CARS whizzing by us, we noticed this marker. 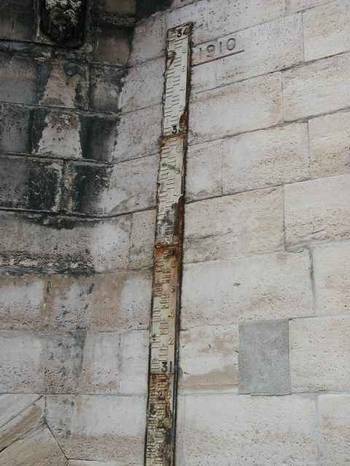 Way above our heads is the mark for the water level during the 1910 flood. Notre Dame comes into view. 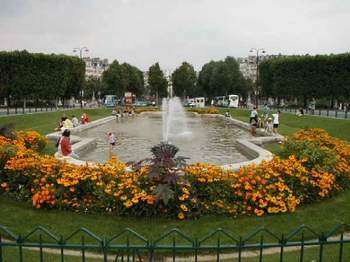 Almost home now -- people are cooling off in this fountain/pool in the center of the Champ de Mars. Late yesterday afternoon, we boarded the Métro and took it to Châtelet, in the heart of Paris. We picked this area for our walk because I realized, much to my horror and amazement, that there was a significant church there that we had not yet visited. 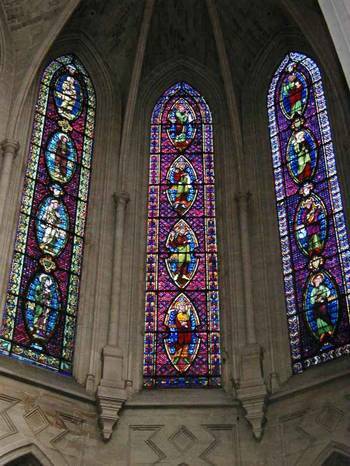 The Église St.-Germain-L'Auxerrois is very, very old. 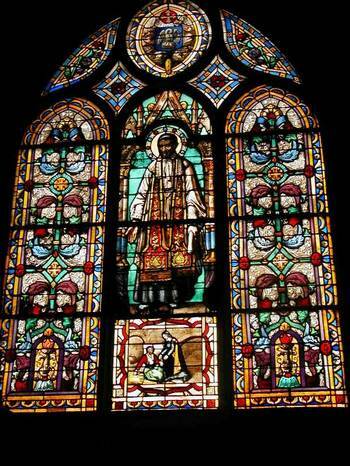 It is named after St. Germanus, Bishop of Auxerre in the 5th century. 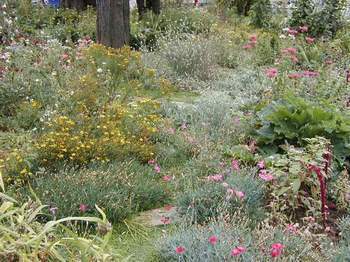 A sanctuary existed on this site as early as the 8th century. 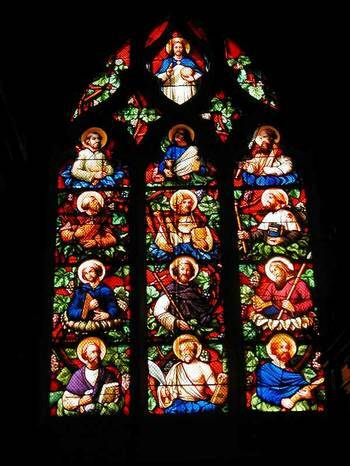 It was replaced by a Norman church, then by a church designed by Robert the Pious. 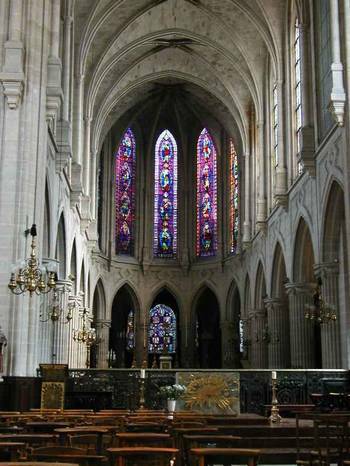 When the Valois royal family moved to the Louvre in the 14th century, this became the king's parish church. So of course, lots of famous people were buried in this church. 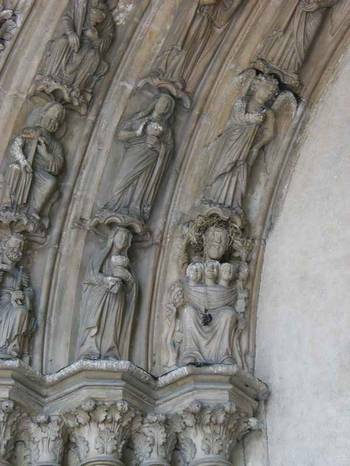 The porch is the most original feature of the structure, dating from 1435 and 1439. 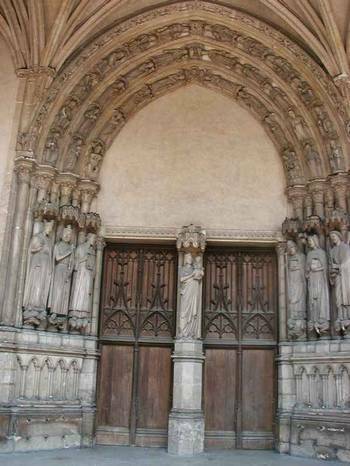 The central doorway is 13th century. 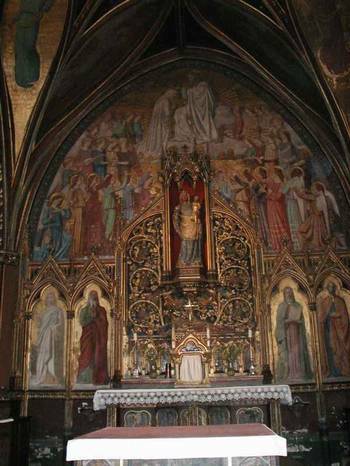 There was a beautiful "rétable" (circa 1530) along one of the church aisles. It had Plexiglas in front of it, so I bought a postcard and have attempted to photograph it here for you -- but the results still aren't great. 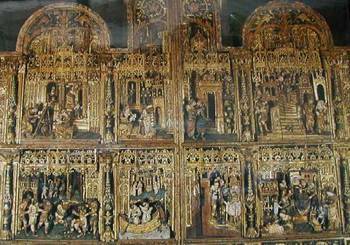 The detail in this piece is amazing -- it depicts the life of Mary. 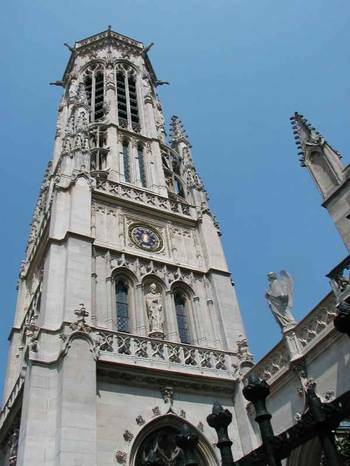 This neo-gothic bell tower designed by Ballu has 38 bells. 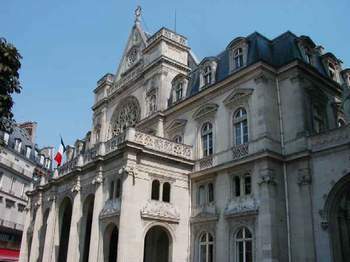 It is located between the Église St.-Germain-L'Auxerrois and the neo-Renaissance Mairie (town hall) for the 1st arrondissement, below. Each arrondissement has its own Mairie. The quai de la Mégisserie, along the Seine between the Hôtel de Ville and the Louvre, is home to many flower shops and pet stores. 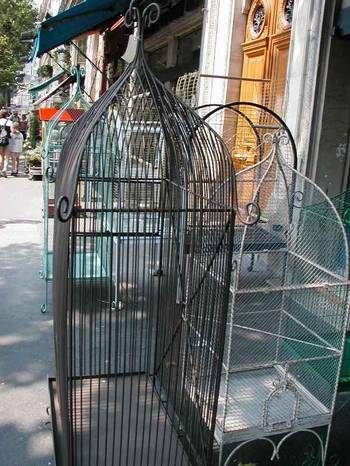 The bird cages, at left, are in front of one of these shops. The street gets its name from an old stinking slaughterhouse that used to be here a long time ago. We stopped to buy a porcelain sign that says "Attention Chat de Garde" (beware of guard cat). This will go near our front door on Sanibel. The city has erected temporary fish benches and banners. 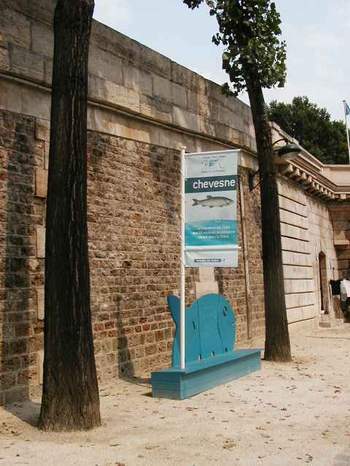 Each banner features, on one side, one of 23 species of fish found in the Seine, and on the other side is a blurb about some environmental mitigation measure taken by the city -- such as monitoring oxygen levels, and making the occasional "deposit" (?) of oxygen in the water. 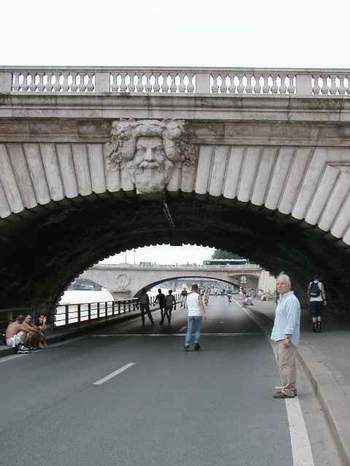 One of three "passerelles" that we are aware of, over the Seine. 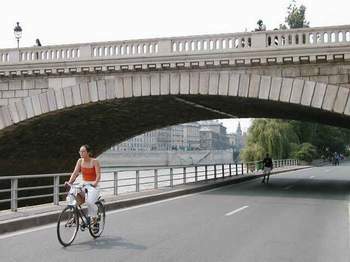 A passerelle is a pedestrian only bridge. Notice the weather is just like Sanibel -- hot afternoons turn cloudy and thunderstorms break out in the evenings. Not to worry -- we made it home before it rained, and when it was time to go out to eat (never earlier than 8pm in Paris! ), we managed not to get drenched. 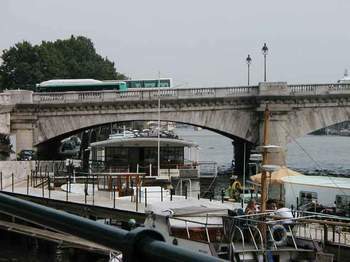 The oldest bridge in Paris, Pont Neuf, and Cité, the island in the Seine that is the center of Paris. 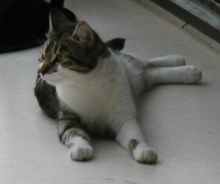 This lucky cat lives on a boat on the Seine. 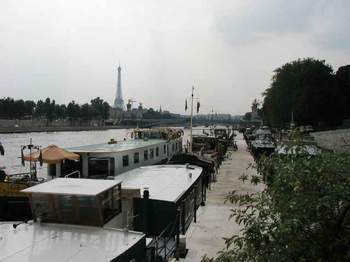 Houseboats at the Port Champs Elysees, across from the Musée D'Orsay. Houseboats at the Port Champs Elysees. The boats can be stacked three deep, and the rule is that you have to allow the others to walk across your boat to get to shore. 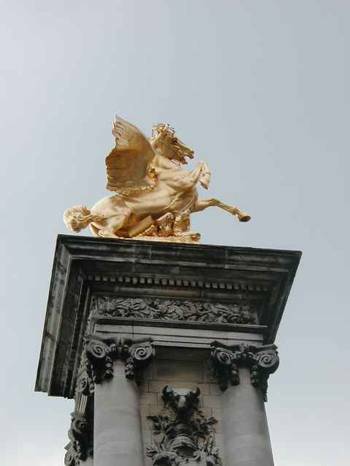 One of the magnificent golden winged horses on the Pont Alexandre III, my favorite Parisian bridge. You can see it below, too. Tom's favorite boat at the Port Champs Elysees. 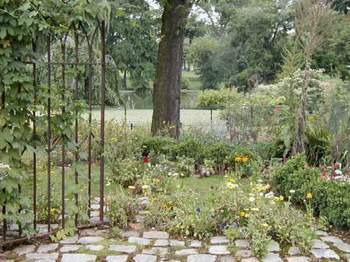 This idyllic garden is, believe it or not, right at the base of the Eiffel Tower, on the east side. Not far away, immediately under the tower, are hundreds of people lined up to go up in the tower.